President Bouteflika’s candidacy had provoked mass protests across Algeria over the past few weeks. No new date for the election was set. A cabinet reshuffle will happen soon, a statement in Mr Bouteflika’s name said. There was no suggestion in the announcement that the president intends to step down before a rescheduled election. Meanwhile, Algeria’s Prime Minister Ahmed Ouyahia announced his resignation and was replaced by Interior Minister Noureddine Bedoui, who has been tasked with forming a new government, the official APS news agency reported. He had pledged last week that he would step down early if re-elected – but the guarantee failed to placate the thousands of demonstrators. Algeria had been hit by strikes by teachers and students, as well as shops closing and train services being suspended as thousands took to the streets. Pressure mounted on Mr Bouteflika to withdraw when more than 1,000 judges said on Monday they would refuse to oversee the planned general election were he a candidate. Then the military’s chief of staff, Lt Gen Gaed Salah, said the military and the people had a united vision of the future – the strongest indication so far that the armed forces were sympathetic to the protests. Top clerics had already criticised pressure on them to issue pro-government sermons. “Leave us to do our job, don’t interfere,” cleric Imam Djamel Ghoul, leader of an independent group of clerics, told journalists. This will be seen as a partial victory for those who have been on the streets for weeks. While it is a guarantee from Mr Bouteflika that he will not seek a fifth term, the absence of a new election date potentially leaves the process frustratingly open-ended. The reaction on social media was swift, and questions are already being asked over the legality of prolonging Mr Bouteflika’s term in office beyond the constitutional mandate. 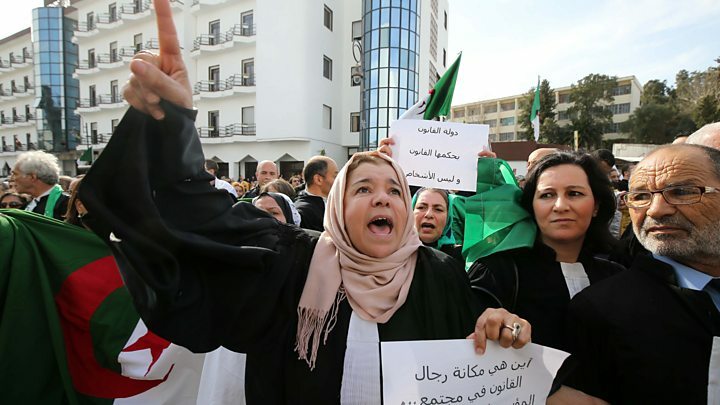 The delay could help to ensure a peaceful transition of power – allowing all candidates to campaign properly while addressing the public’s core demand of removing Mr Bouteflika from office. But key to satisfying the protesters’ demand will be a timetable for his departure. And the legitimacy of an election does not stop at the ballot box – the ruling elite, the country’s judges, and its electoral bodies will need to demonstrate a genuine will to ensure a free and fair poll. Algerians have shown they are no longer willing to accept the status quo, and that will undoubtedly extend to close scrutiny of how the next election plays out. Was Bouteflika’s health a factor? The president’s announcement came a day after he returned home after a two-week stay in a Swiss hospital, where he has been for treatment since suffering a stroke in 2013. He has over the years since his stroke become a virtual recluse. His last public address was in 2014, shortly after winning the previous general election. Many Algerians were concerned about his ailing health, and worried that his death in office during a fifth term might cause dangerous political instability. French Foreign Minister Jean-Yves Le Drian welcomed President Bouteflika’s decision not to seek re-election. “France expresses its hope that a new dynamic that can answer the deep aspirations of the Algerian people will rapidly take hold,” he said in a statement. Meanwhile, people on the streets of the capital, Algiers, have been celebrating the news.